We live in a Colorado mountain town, where snow cover typically lasts from November to late May. Our Bichon comes in bearing a collection of little snowballs plastered to his legs, which melt all over our floor. I’m so thrilled to have found this! It’s too thick for the unusually low clearance of our door, but we’ve put it to the side and I’m training him to sit on it as soon as he comes in, while I dry him off. Next purchase, the Soggy Doggy drying towel! Btw... the doormat received our dog’s stamp of approval, too: he stretched out on it as soon as I put it down! A product that has exceeded our expectations and is worth every penny! I’ve been using the soggy soggy doormat for about a week. It is very absorbent and catches much mood of the doggy dirt than my old one did. I have two big dogs and this mat has been very helpful in keeping my floor clean. You’ll never regret purchasing this product. Great rug at doorway where my dog comes in! Really helps with keeping mess at the door instead of all over the floors. 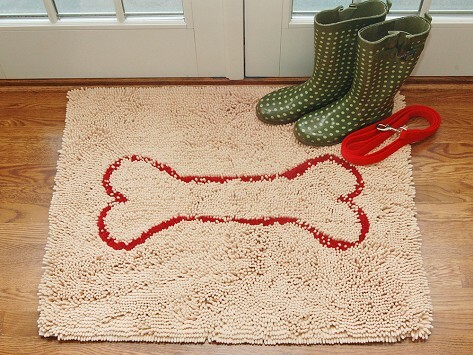 This is an indoor rug to protect floors from paw prints, dirt and debris our pups track inside the house. But the dogs love it so much, it has become another dog bed! So I guess this is a dual purpose rug! I’d love a blanket in this material, just FYI! Awesome! Thanks! Attractive and practical. My dog loves it. He sleeps on it more than his dog bed. Great quality. Bought a second one because I loved it so much!! This was ordered to protect the floor, little did we know, it is a new pillow/blanket! Having 3 of these rugs already, purchased 4 for our master bathroom. Better looking, better quality and more absorbent than some expensive designer rugs on the market. Love these rugs and have also gifted a few.